In November 2008, while I was going for an early morning run around my neighborhood in West Long Branch, N.J., I noticed a beautiful solid black kitten with big gold eyes sitting on a hill across the street from where I lived. When I saw this black kitten, she reminded me of my 2 childhood cats. When I was a little boy, I had a black cat named "NUBBS" who lived with me during most of my childhood, High School and College years into my adult life. Prior to owning "NUBBS", when I was very young, we had a black cat named "PUFF". Usually when I would go running by a cat, it would take off like a squirrel does. However, each morning that I would go running by this beautiful black kitten, she did not budge! I would sometimes run within only a few feet of this kitten, but instead of running away, she would just stare at me. After about 3 weeks, I asked the woman who has been feeding the kitten outside, "Is this your cat? This is a very special animal"! She replied, "No, someone left this kitten and another gray kitten in a shoebox in the woods." She continued by saying, "If you want the kitten, you can have her." A few moments later, I was across the Street stretching my calves on the curb and I felt something by the lower part of my legs. It was the black kitten rubbing against me! She must have gotten brave when she noticed me speaking with the woman who had been feeding her. She also was purring very loudly. When I returned to my house, the kitten went back across the street where she had been hanging out. The following Morning when I went for my early morning run, the kitten was waiting for me on my front porch. Then an AMAZING thing happened! The kitten started running with me! She led the way and ran with me all the way to the end of the Cul-de-sac and then back to her home at the top of the street. Fortunately, when I continued running into town, she stopped at her house across the street. There would have been too much traffic if she went running in town with me. Each morning when I finished my run, I sprinted down my block to the end of the Cul-de-sac. When I did, another AMAZING thing happened. While I was taking my Heart-Rate at the end of the block, I noticed the black kitten charging down the street to come and greet me! Then she walked back with me while I did my cool down walk. This routine took place almost every morning. Some mornings, the kitten would run down the sidewalk on her side of the street, other mornings she would run down the sidewalk on my side of the street and sometimes she would run on the road with me! I asked many veterinarians and cat experts about cats running with humans and nobody ever heard of such a thing. Most of their responses were, "Dogs run with humans, not kittens or cats!" I loved this kitten very much and had to own her for myself. In January 2009, I went to the SPCA in Eatontown, N.J. to tell them about this wonderful kitten. They referred me to their Low-Cost Spay/Neuter Clinic. I called them the following Monday morning. Then I had to call the woman across the street to notify her that I was taking the kitten. I was little nervous being we had not spoken for about 3 weeks. I thought she might have gotten attached to this kitten or maybe she was going to give the kitten to someone as a XMAS present! When I called the woman that day, I had the kitten on my lap in my car. I figured if the phone call did not go well, I was going to take my running partner kitten anyway! When I told the Woman......at first she paused! Then she asked me, "Do you know the kitten? Does the kitten like you?" I said, "Does she like me? She is my running partner and is sitting on my lap as we speak!" The Woman was SO HAPPY!!! I told her I would pay her for feeding the kitten, because she would have to continue to feed her until I could bring her to the Vet Clinic the following Monday morning. She responded, "Don't Be Silly!" Since the black kitten ran on the streets with me almost every morning, there really was only one name for her: "ROADRUNNER"!!! :) She also enjoyed jumping on my lap when I was in my car leaving for work each morning! I went to "PETSMART" and bought "ROADRUNNER" a purple collar with a bell on it. I also bought a big bag of very healthy hard kitten food, which was high in protein and included rice, moisture, etc. The employees at "PETSMART" were very helpful. "ROADRUNNER" got very tall and very lean quickly, most likely from all of her running. She has since filled out very much! "ROADRUNNER" is the only Long Distance Running Cat in the World and she leads the way! February 2009 was when I first took "ROADRUNNER" running, without a leash, around my old Little League Baseball field on Van Court Ave., in Elberon, N.J. We ran around the outfield, the infield and hung out on the bench in the dugout. It brought back a lot of terrific childhood memories for me of myself playing with my Long Branch Elks Little League Baseball Team! Since early 2009 I have trained "ROADRUNNER", indoors & outdoors, almost every morning. For "ROADRUNNER'S" safety, we usually train in the very early morning before anyone else is awake, outside or driving on the roads. "ROADRUNNER" also loves to run in the dark. She really enjoys running on the beach and jetty here at the Jersey Shore. Running up and down the jetty is one of "ROADRUNNER'S" favorite tricks! "ROADRUNNER" stretches prior to running and drinks water before and after she completes her daily exercise routine. "ROADRUNNER" is very jealous of my laptop computer. She usually climbs up and faces me so I cannot look at the keyboard! She Head-Butts me and my Laptop too! She used to bite and swipe at my fingers so I could not type! She also sits on top of my Cell Phone so I cannot find it! Funny! At night, she sleeps on my stomach with her head on my chest and her paws by my throat! YIKES!!! 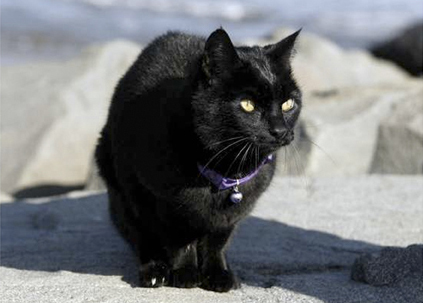 "ROADRUNNER" is an incredible black cat whose Birthday is on April 30, 2008. My dear Mother, who always loved black cats, sadly passed away on April 30, 1999. "ROADRUNNER'S" Birthday cheers up the saddest day of the year for me.